Posted in Middle Eastern, recipe, salads, savory by Antonio Tahhan on July 28th, 2009. You can follow any responses to this entry through the RSS 2.0 feed. You can leave a response, or trackback from your own site. Your food always looks so fresh and vibrant. They do say the Middle Eastern diet is so healthy, right? I think I might give this one a go. Just looking at it is hitting the spot. Does this taste as pretty as your pictures? Is that a Fattoush! or did you just sneeze! I love the word and the salad, of course! 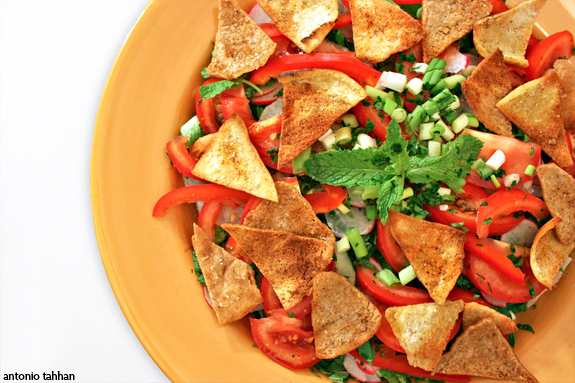 Fattoush is my all-time favorite salad. It’s so good. Yours is beautiful. Great pictures. I do my bread, like you, in the oven. I’m craving this now. Beautiful post, as always. 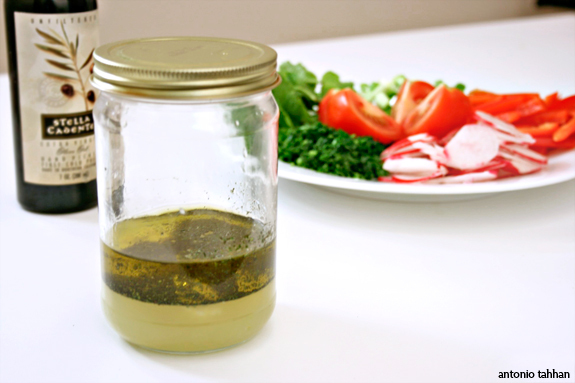 I just want to mention that one ingredient that is essential to fattoosh is purslane or bakleh or mache in French. My friend grows it in her yard here in Texas next to her molookhiyeh. I buy it at the middle-eastern stores or mexican stores. Joumana, you are absolutely right. I tried looking for purslane, but had no luck at my local market. I will add a note to the recipe – thanks for pointing that out! MMmmm looks delightful and I have most of those ingredients in my fridge. This is going to be lunch tomorrow. I adore fattoush!!! You’re right, it’s rustic appeal is undeniable and comforting! 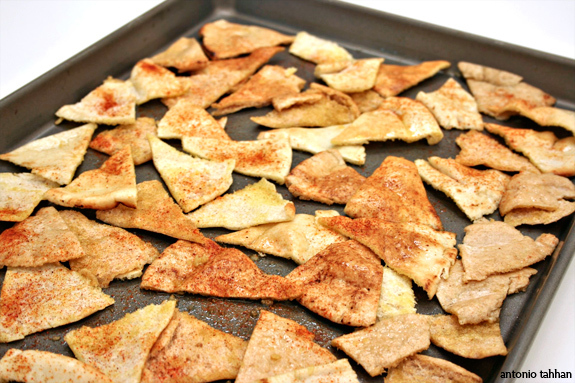 and it all about those pita shards on top! They always stab my mouth because I eat it so quickly… but it’s worth the pain! 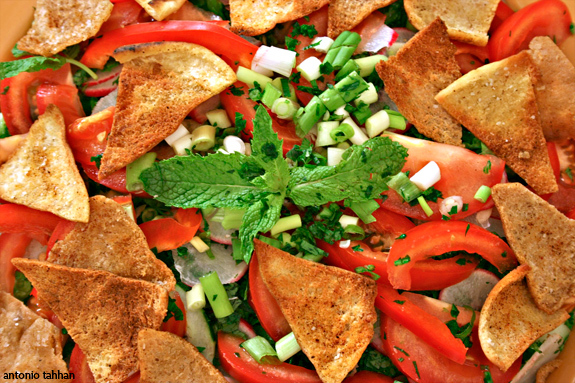 I LOVE a good, garlicky fattoush! Thanks for posting this great recipe. It was my first visit to your blog while I was looking for a tabbouleh image for my daughter Christina’s school project. Great job! Finally I find real fattouche recipe the way we do it in Lebanon. You can also add pomegranade syrup *debes remmen* for those who know it! 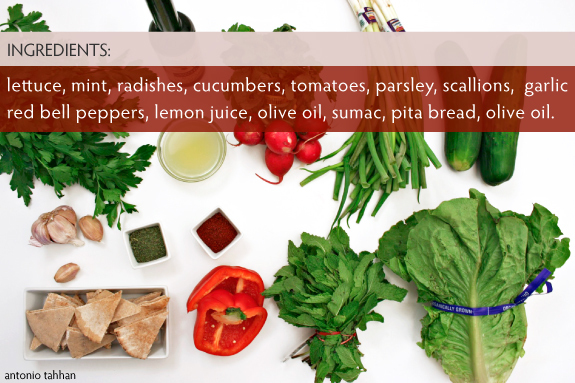 I was surfing fattoush recipes, but want to compliment you on your blog layout. It’s very well done. I’ll probably be posting about my fattoush soon. Thank you for your inspiraton. Hi Mary! Thank you for the comment. Yes, ground sumac is what you want to get. I use Ziyad brand for sumac and Cortas brand for orange blossom water. If you can’t find those brands just make sure to read the ingredient list to make sure there isn’t anything strange in there. I hope this helps!